This product contains 20 Bingo Cards and incorporates 32 different words. These cards are editable so you can create more boards, eliminate or add to vocabulary or do whatever best fits your classroom. This product contains 32 flashcards that are related to a house such as names of furniture, names of rooms and names of parts of houses (such as stairs, room, yard). 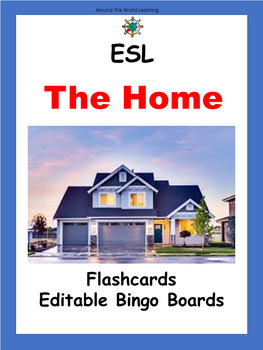 This product is designed for ESL/ELL students and contains 32 flashcards related to the house and 20 Bingo Boards using the vocabulary. The Bingo Boards are editable.